If the Twin Cities is a fertile playground for experimental and improvised music, then St. Paul’s Lowertown is one of its hottest incubators, and particularly that short path between the Black Dog Café and Studio Z. Studio Z has been home to the Zeitgeist ensemble, sitting somewhere between modern classical, avant garde jazz and free-wheeling “improvised” soundscapes, but the venue supports a wide range of artists and mini-festivals in its warehouse space. The Black Dog has at least weekly series of experimental music, performance home to the Fantastic Merlins and series curated by composers Nathan Hanson and Brian Roessler. This weekend, both venues offered some of the best examples of innovative, hard-to-classify music. Just the name conjures magical entertainment. Sax, cello, bass and drums inventing new sounds, melodic and percussive across all voices. The original Merlins included saxophonist Nathan Hanson, bassist Brian Roessler and cellist Jacqueline Ultan, in what started out as a gig at the now musically defunct Clown Lounge in 2004. 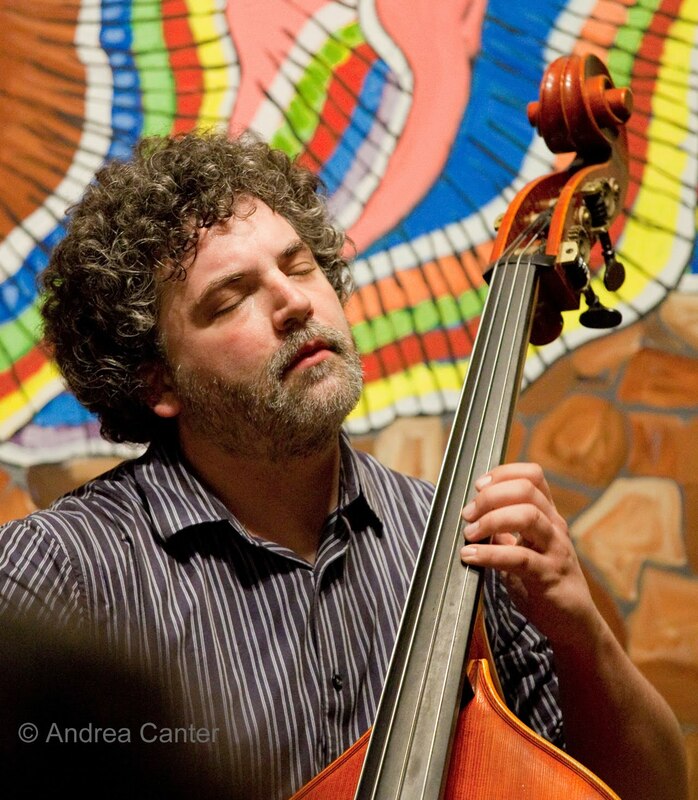 With additions and personnel changes over the years, the Merlins today are a quartet, with Hanson and Roessler sharing honors with New York cellist Daniel Levin and Atlantis Quartet drummer Pete Hennig. They’ve been performing in Europe and New York lately, and getting the band together for one evening is a challenge. They made the most of it Friday, starting with a public master class that drew a good number of area musicians and observers, later filling the tiny concert space and then some for a 2-set concert. The Black Dog is a challenging venue, not only due to the small area set aside for music, but also due to the sonic competition that comes when you mix cellos and saxes with espresso machines and telephones. Yet, somehow, the accidental auditory stimuli manage to fit right into the freedom of the intentional music. Even a Frisbee flying outside the café window seemed strangely assimilated into the whole experience. Levin, who has played with such luminaries as Billy Bang, Tim Berne, Anthony Braxton, Mark Dresser, Joe McPhee, William Parker and Ken Vandermark, adds layers of excitement to an already exciting ensemble with long-bow glides, pizzicato static, and clever harmonization, particularly with Roessler’s bass. Hanson can cover a lot of territory on both tenor and soprano, often working in extended tandem with Hennig, who alone can muster much of an orchestra. 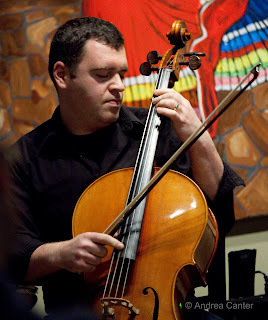 And Roessler coaxes warm melodic tones from his big ax, suggesting, at times, another cello. You never know where the music is going. But somehow, it gets there. Once I saw him Saturday night, I remembered Kip Jones. Some years ago, he played with the Parisota Hot Club and Connie Evingson at the Burnsville Art and All That Jazz Festival. So I associated him with gypsy swing. Which is not really an error but suggests boundaries that do not exist in his music and overlooks a broad repertoire of original and interpreted compositions from diverse cultures, from South Korea to South America. Jones held a two-night CD release celebration at Studio Z, with a full house (at least on Saturday), complete with temporary risers to accommodate more chairs. Anyone coming in to hear some Django Reinhardt would have been startled, hopefully in a good way, as Jones’s music is simultaneously innovative and accessible, beautiful and engaging, strange and familiar. 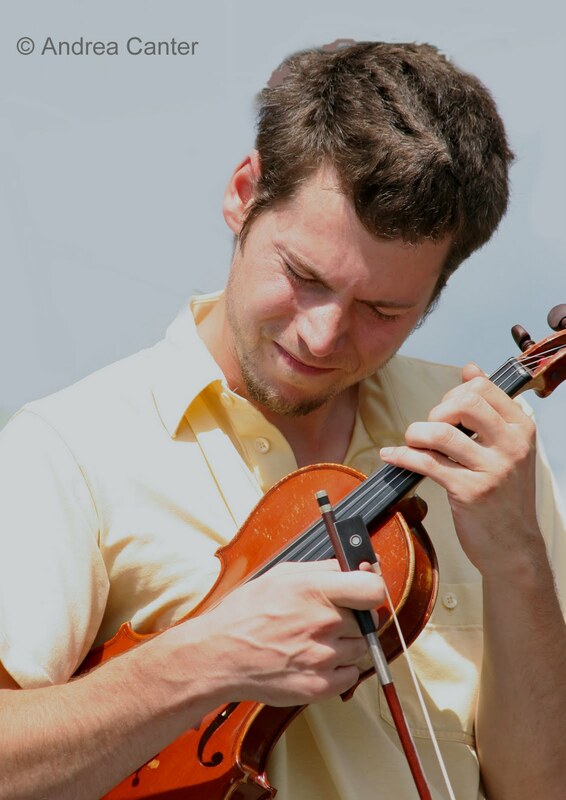 An agile violinist, Kip Jones also has a pleasing tenor voice. And in his solo set, he accompanied himself on original compositions, mostly drawn from his year in South America, his two “instruments” blending in stunning harmony, at times classical, folkloric, liturgical, Middle Eastern, East European, Latin. He conjured Andean bluegrass, River Dance, Kol Nidre, Aaron Copland. The vocals were Korean, Spanish, maybe Jones. The second set, a trio with accordionist Patrick Harrison and bassist James Buckley, was more Americana than the solo set, but bringing in global influences as well-- a new “fake Finnish folksong” (as per Kip), a Macedonian gypsy whirl, a swarthy tango with slithering bowed bass, a rip-roaring jamming finale with Harrison and Jones adding vocal accents. It’s new world music with Old World echoes. The Black Dog Café has a relatively new weekly series of experimental music, “Community Pool.” Check the website for specific performances. Zeitgeist will hold open rehearsals during the upcoming St. Paul Art Crawl (April 29-30) and will join forces with avant garde accordionist Guy Klucevsek May 12-14 at Studio Z. And Z has been tapped as a new venue for the Twin Cities Jazz Festival (June 24-25), expanding the range of TCJF to more fully encompass free jazz. So just hang out in Lowertown. There’s lots of cool experiments going on!